September 15, 2018 (Chicago) — Great Lakes beaches are getting a deep clean today as thousands of volunteers head out for the Alliance for the Great Lakes’ annual September Adopt-a-Beach cleanup event. Thousands of volunteers will be joining hundreds of cleanup events around the Great Lakes region this morning. In addition to keeping Great Lakes beaches safe and clean, the cleanups keep plastic pollution out of the lakes. A vast majority – more than 85% – of the litter picked up by at cleanups each year is plastic. Last year, more than 6,300 volunteers picked up over 11,000 pounds of debris at more than 240 sites around the region. In addition to cleaning up beaches, volunteers collect valuable data which is shared with beach managers and scientists. 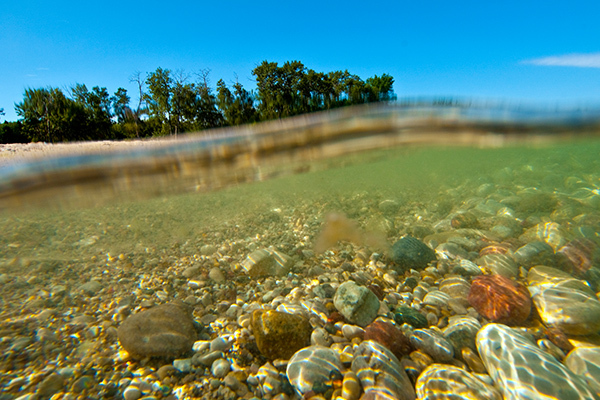 The result: cleaner beaches and healthier Great Lakes. Data collected by Adopt-a-Beach volunteers gives insight into the most common types of litter. In 2017, the majority of trash picked up by Adopt-a-Beach volunteers (87%) was plastic including a wide range of items like cigarette filters, water bottles, food containers, and even left behind beach toys. More than 22 million pounds of plastic pollution end up in the Great Lakes every year. And, it never really goes away. Instead, it just breaks down into smaller and smaller pieces known as “microplastics.” Researchers have found high amounts of tiny plastic pieces in all five Great Lakes, which provide drinking water for 40 million people. They’ve found microscopic pieces of plastic in drinking water, and even beer. Alliance volunteers are part of a global day of action, as September Adopt-a-Beach coincides with the International Coastal Cleanup. More information about the Alliance’s Adopt-a-Beach program, including how to find events in your community, can be found at www.greatlakes.org/adoptabeach.